A type of application software that serves as a personal organizer is called personal information manager (PIM). As an information management tool, a PIM's purpose is to facilitate the recording, tracking, and management of certain types of "personal information" such as personal notes, address books, significant calendar dates, reminders, email, RSS/Atom feeds, voicemail and more. KonsoleKalendar is a command line interface to KDE calendars. It lets you view, insert, remove, or modify calendar events by way of the command line or from a scripting language. Additionally, KonsoleKalendar can export a KDE calendar to a variety of other formats. 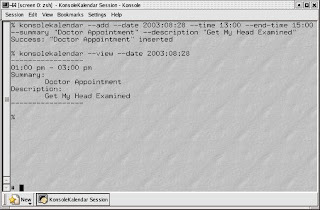 KonsoleKalendar is intended solely for uses where a graphical user interface is not practical or possible. KonsoleKalendar is part of the KDE PIM package. Task Coach is a simple open source todo manager to manage personal tasks and todo lists. It grew out of the frustration that well-known task managers, such as those provided with Outlook or Lotus Notes do not provide facilities for composite tasks. Often, tasks and other things todo consist of several activities. Task Coach is designed to deal with composite tasks. 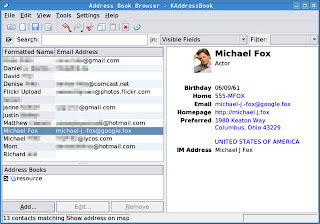 Kontact is a personal information manager and groupware software suite for KDE. It supports calendars, contacts, notes, to-do lists, news, and email. It uses KParts to embed the various applications into the container application. 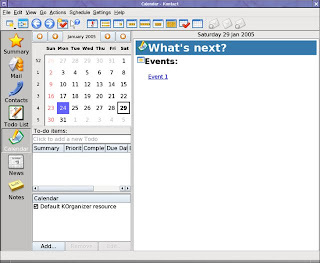 OpenSync is a software library framework used for synchronization of PIM data (contacts, calendar, tasks and notes) between personal computers and mobile devices. 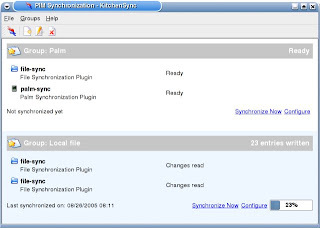 OpenSync is plugin based and its product specific plugins allows support for wide variety of different synchronization endpoints (PIM applications, mobile phones, personal digital assistants, groupware servers, and LDAP directories). Its design and implementation would allow other synchronization uses as well. OpenSync has been selected to be KDE's main synchronization framework. It is a cross platform software that can be run on Microsoft Windows and various Unix-like systems including Linux and Mac OS X. * Exports and imports cards to and from vCard format. * Uses DCOP to interface with other applications. * Interoperable with KMail and Kopete, as well as Kontact. * Customize fields and categories. * Automatic formatting of names. * Filter ability, to search for addresses. * Capability to query an LDAP database containing person information. 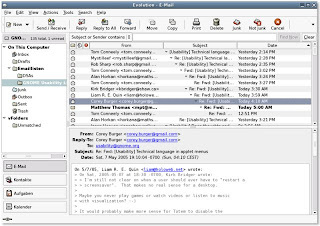 Evolution or Novell Evolution (formerly Ximian Evolution, prior to Novell's 2003 acquisition of Ximian) is the official personal information manager and workgroup information management tool for GNOME. It combines e-mail, calendar, address book, and task list management functions. It has been an official part of GNOME since version 2.8 in September 2004. Evolution development is sponsored primarily by Novell. Evolution can be connected to a Microsoft Exchange Server using its web interface and an Evolution add-on formerly called Ximian Connector. Using gnome-pilot, it may be synchronized with Palm Pilot devices, and OpenSync enables it to be synchronized with mobile telephones and other PDAs. The Mozilla Calendar Project is the name for the Mozilla project involved in the development of Sunbird calendar application and the Lightning integrated calendar. Sunbird and Lightning are both free software, released under the Mozilla tri-license: the Mozilla Public License, the GNU General Public License and the GNU Lesser General Public License. Mozilla Sunbird is a cross-platform calendar application, built upon Mozilla Toolkit. Its goal is to provide full-featured and easy to use calendar application that can be used around the world. 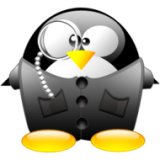 If you have other free and open source Personal Information Managers (PIM) to add to the list above, please share them with us via comment.